According to GlobalWebIndex, one in four YouTubers watched a branded video last month. It’s not just millennials using YouTube, either. Google shows that YouTube reaches 95% of online adults age +35 in a month. And according to new demographic data from Google, YouTube’s reach continues to expand to older audiences. 1. Stop hacking. Start promoting. If you search “how to get free YouTube subscribers,” you’ll discover a delightful subgenre of social media advice dedicated to ‘hacks and glitches for YouTube.’ These shortcuts—often sold in sensational headlines like ‘how to get millions of free YouTube subscribers’—promise to teach you a hidden trick that will flood your channel with free YouTube subscribers (the truth is YouTube hacks only exist if your definition of a “hack” is a little-known feature). 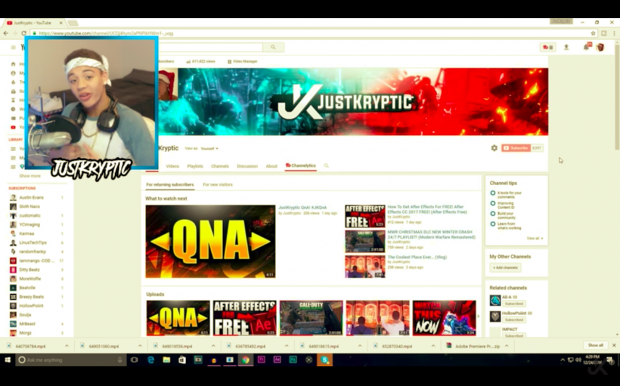 One of the most popular YouTube tutorials for getting free subscribers comes from a young expert named JustKyptic. During my research for this post, I have to admit—his headline hooked me. According to Mr. JustKyptic, he’s discovered a YouTube glitch that gets you thousands of free YouTube subscribers in just a few seconds. If you watch the video, you’ll learn JustKryptic’s YouTube hack. As he shows, you can open up your developer tools in Google Chrome. As you may know, clicking “view” > “developer” > “view source” reveals the HTML source code for any webpage. Next, Mr. JustKryptic clicks on the “YouTube subscriber count” button. And with a flick of his wrist, he changes his YouTube subscribers from 500 to 1000. He warns against changing it higher as YouTube might ban your account. I’m sure you can spot the error? 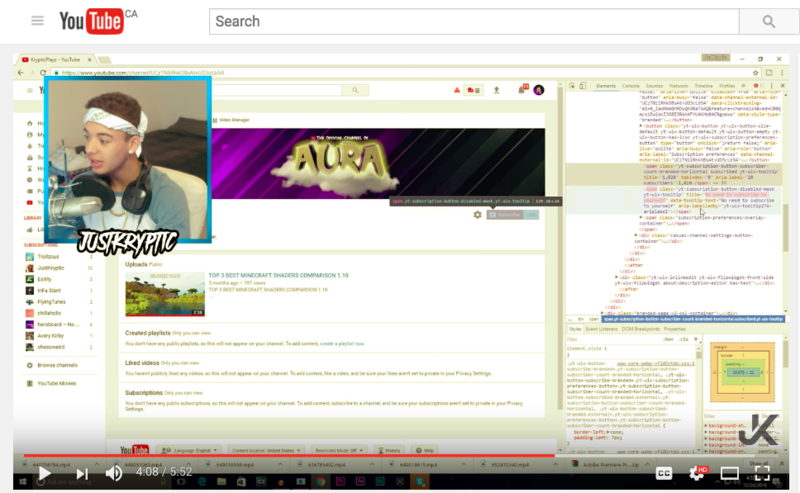 JustKryptic is only editing the source code on his own Chrome browser. Only he can see that his YouTube subscriber count has increased—this is not a real change made in YouTube but is simply on his own personal browser. At the end of the video, he admits this is a prank. I watched five more of these YouTube hack videos. And most followed the same format: they were a prank. So if you’re searching for YouTube hacks, you’re likely wasting time. But you still need subscribers. If you have a new or unknown YouTube channel, you need to gain some sort of traction. Without the attention of YouTube’s algorithm, your videos won’t appear in search results or appear in recommended lists. So how can you get the organic ball rolling? I asked this question to Gianni “Luminati” Nicassio, a founding member of the indie-band Walk Off The Earth. Gianni used YouTube to catapult his unknown band into a global act, earning over 634 million organic views from YouTube. Your task: Stop wasting time looking for YouTube shortcuts. Instead, build a plan to promote your YouTube channel. Start with manual tasks. And once you have some traction, free YouTube subscribers and organic traffic will begin to appear. I wanted to know how to build a YouTube following from scratch, so I interviewed Graham Cochrane, the founder of the popular YouTube channel “The Recording Revolution.” Cochrane went from unemployed to creating a 7-figure business around audio engineering tips. YouTube has been a key distribution channel for him. Cochrane says publishing frequency is key. This frequency helps you retain subscribers (another important metric for YouTube) as well as helps you attract new free YouTube subscribers. A simple formula that works is this: 1×4. Publish four YouTube videos every month. That breaks down to one video every week. It’s an easy number to remember and you’ll soon see new YouTube subscribers trickling in. Your Task: Commit to a publishing schedule. An easy formula: one YouTube video every week for a total of four a month. 3. Stop talking. Start delivering. How can you increase your watch time? There are lots of tips and tricks online. But the most important principle is this: value your viewer’s time. Your Task: Shorten your intro. Skip the flashy intro and theme music. Make sure the first eight seconds of every video hook viewers. You work hard to acquire a first-time viewer. The viewer needs to search for a relevant keyword, see your video in YouTube’s results, and click your result. To turn these casual viewers into subscribers, use YouTube playlists. These boost content consumption, retain subscribers, and boost your watch time. 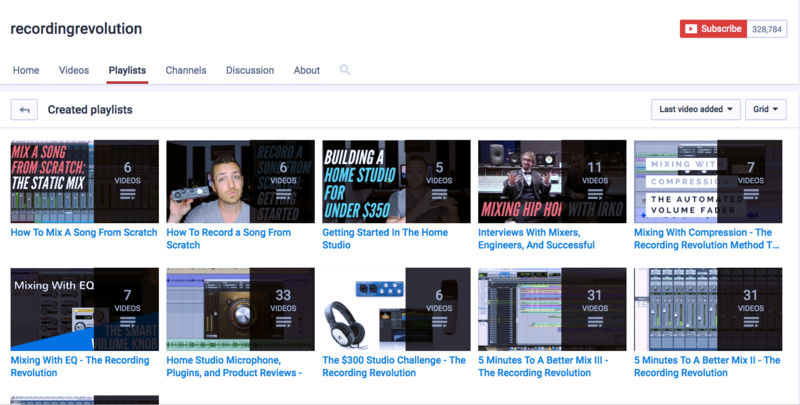 Instead of creating miscellaneous playlists, create a track of content for new users to watch. In other words, treat your viewers as a cohort, segmenting your audience into groups of users that will move through your content. New viewers—what content should a new viewer watch first? I recommend creating a YouTube playlist that says. “New to this YouTube channel? Watch these first.” This playlist needs to introduce the viewer to your channel and deliver your best, funniest, or most helpful videos that will convert them from a searcher to a subscriber. Task-orientated viewers—If you offer educational content, a large portion of your audience will be looking to solve specific problems. This might be learning a specific skill or fixing a problem. Cochrane (the YouTube expert quoted above), for example, has specific playlists that help his audience complete different music tasks. These playlists increase content consumption as well as remind people that your channel is a good place to look later if they encounter a challenge. You can see Cochrane’s playlists below or by clicking here. It’s easy to create a playlist in YouTube. Your Task: Create YouTube playlists based on three viewer cohorts: first-time viewers; task-orientated viewers; and topic-focused viewers. Most of your subscribers will discover your channel by either searching in Google or via YouTube’s search bar. Pinterest is also a visual search engine, making it a perfect match for your YouTube strategy. Not every business or brand is right for Pinterest. To determine whether your customers live on Pinterest download our helpful audience worksheet. Hire a designer to turn a few of your best YouTube videos into Pinterest-friendly images. For example, if you run a YouTube cooking channel, you might have a Pinterest visual that offers tips for proper knife techniques or quick tips about baking. On each visual asset, link to your YouTube channel and tell people they can watch the full video there. Consider investing some budget in Pinterest ads. They are quite effective and will help boost your visibility. This is optional as people will naturally discover your Pinterest collections via search. Your task: Build SEO-focused Pinterest collections that link back to your YouTube channel. Is your YouTube channel about a product category such as electronic gear? Or maybe it covers a topic that lots of books have been written on such as gardening, arts and crafts, or fashion. Leave reviews on popular Amazon products and mention your YouTube channel. Let’s say you have a YouTube cooking channel. You could leave reviews for popular cookbooks—such as The Joy of Cooking or a new book out by a celebrity chef—and tell people that you’ll be testing out a few recipes on your YouTube channel. Or if your YouTube channel is about hiking gear—you can mention that you’ve reviewed a popular piece of equipment on your channel. According to Amazon’s review guidelines, you’re not allowed to post URL links to external sites. So if you include a link to your YouTube channel, your review will be banned. But you can mention your channel—such as “I also reviewed the Joy of Cooking on my YouTube channel ‘Cookin’ with James and Owly’”—and gently promote your channel. YouTube also allows you to post video reviews of products. If you leave a video review, end the video with a subtle shout-out to your YouTube channel. Your task: Find popular books or products related to your YouTube channel. Add a genuine and thoughtful review on Amazon. At the end, mention your YouTube channel. Note: it’s against Amazon’s policy to include a URL. But you can mention your YouTube channel name so that people can search for it in Google. Over the last year, I’ve been rediscovering Facebook Groups. You can find a group for most topics and interests. For example, #TeamofOne is a community of social media consultants and strategists. I also follow a copywriting group, as well as groups related to my hobby of music production. You can find relevant Facebook Groups by searching “YOUR KEYWORD” with the filter of “Groups” in the Facebook search bar. To browse different groups and sort by interests, use Facebook’s discovery feature. If you sell local products, you can find local buy-and-sell groups here. Your task: Find 10 to 20 relevant Facebook Groups and add a comment, telling people about a YouTube video you’re proud of. If you don’t want to do this manual work, outsource to a freelancer using Upwork. Reddit users organize themselves into subreddits. These are communities based around a topic. Find 10 to 20 subreddits and tell people about your YouTube channel. Your Task: Find 10 to 20 subreddits and post a link to a YouTube video you’re proud of. I wrote a comprehensive guide to finding subreddits here. I also asked Cochrane if he had any simple optimization techniques that people tend to overlook. He recommended spending a few minutes creating SEO-focused titles and descriptions. “The best thing you could do is create YouTube titles and descriptions that have the most relevant search terms in them,” says Cochrane. Your Task: Use YouTube’s autofill feature to create SEO-friendly titles and descriptions. It’s hard to find a winning YouTube formula. But once you hit gold, you need to focus your efforts on replicating success. After publishing for a few months, you’ll likely have a few videos that resonate. I recommend translating these popular videos to a few languages (such as German, French, and Spanish). This helps you rank in international markets, gain new free YouTube subscribers, and expand your reach. It’s always a good idea to add subtitles to every YouTube video as well. Your Task: Hire a translation company to turn your top-performing YouTube videos into international hits. YouTube is a fantastic way to attract free subscribers. And often what works on YouTube can also work on Facebook, Instagram, and Twitter video. Expand your reach by publishing your YouTube videos on different social networks. With Hootsuite, you can do this pretty quickly. Use Hootsuite to upload and schedule your YouTube videos—and then publish that same video to other video networks such as Facebook, Instagram, and Twitter. It’s also easy to use our video integrations—such as the amazing tool Vidyard—to access detailed video and conversion data. You can learn more about how Hootsuite makes social video management easy here. Your Task: Once you’ve mastered YouTube, republish your best video content to Facebook, Instagram, and Twitter. Hootsuite can help here, letting you manage all social video networks from one fast platform.